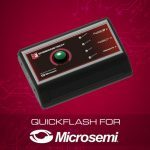 The QuickFlash Programmer is Embeddetech’s off-the-shelf solution for programming all Actel FPGAs in-system. The programmer is highly configurable and is capable of storing up to 32 FPGA images (.DAT or .STPL files). The programmer’s configuration allows a custom script to be run when the Program button is pressed, allowing any number of devices connected to the JTAG chain to be programmed. 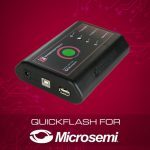 Both the FlashPro3 (10-pin) and FlashPro Lite (26-pin) programming interfaces are supported, guaranteeing that the Programmer is capable of programming your existing design. 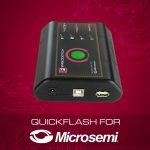 Due to its configure ability and standard USB interface, the QuickFlash Programmer for Microsemi is ideal for any development, manufacturing, or field upgrade requirements. No parallel port interface adapters needed! 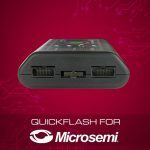 The QuickFlash Programmer supports standard USB host and USB device interfaces. A USB host port is available to conveniently copy image files from a USB thumb drive onto the Programmer, and run scripts from a text file on the thumb drive. A USB device port is available for communicating with the programmer, setting up scripts manually one operation at a time, and monitoring the Programmer’s activity during a “Program” operation for diagnostic purposes. Once the programmer is configured, however, neither the USB host nor device ports are needed… just power the programmer, plug the programming cable into your target, and press the “Program” button. 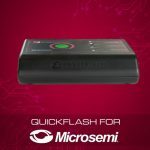 The QuickFlash Programmer configuration process is extremely easy, using the QuickFlash Configuration Wizard. The Configuration Wizard sets up the programming script after questions about your programming requirements are answered, and then the wizard can directly configure the Programmer over USB. 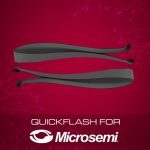 The configuration file can be saved and reused for other QuickFlash Programmers. The Programmer’s script can specify any number of devices on the JTAG chain to be programmed with unique images, all with the press of one button. STAPL files store FPGA data in a compressed format, which normally is decompressed for each programming operation. 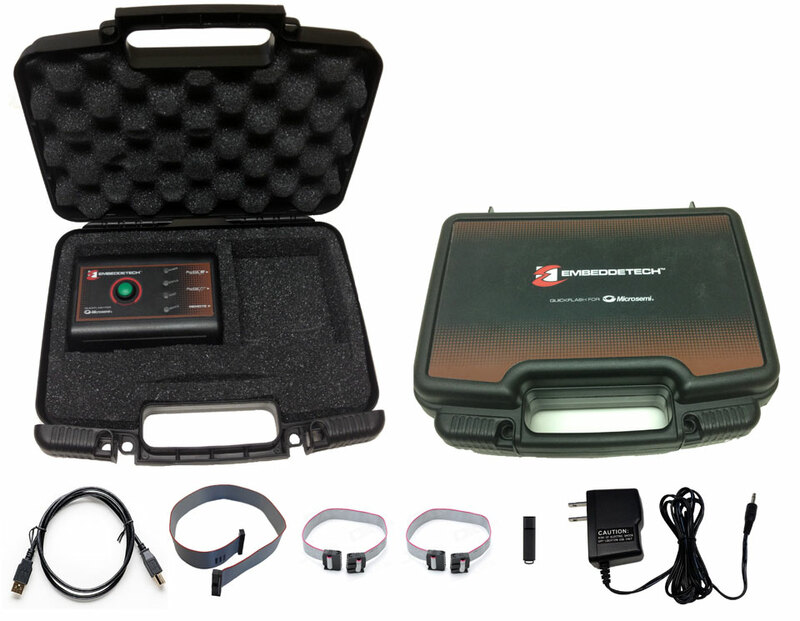 The QuickFlash programmer decompresses the STAPL file only during the first programming operation and stores the decompressed data non-volatilely. All subsequent programming operations use the previously decompressed data, accelerating programming time. 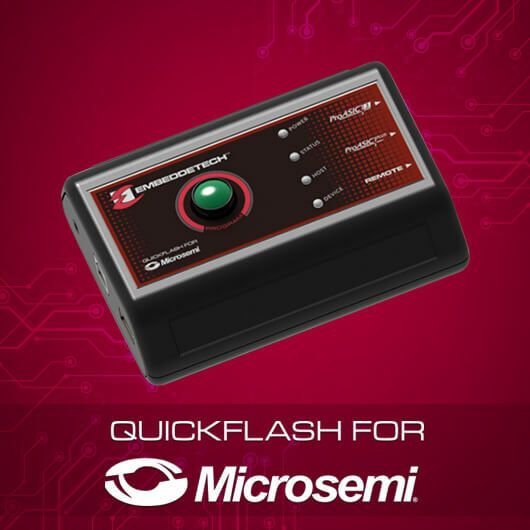 The QuickFlash programmer can program all Actel FPGAs, including ProASICPLUS FPGAs. The Programmer ships in a re-useable foam-lined carrying case, for convenient and frequent deployment of the programmer for remote field upgrades. Embeddetech and the ‘E’ logo are registered trademarks of Embeddetech, Inc.